Shrimp Salad is the best salad anyone could ever cook. It`s very easy to make it and the taste is yummy. 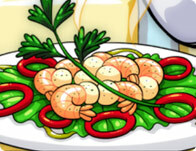 Fry up some shrimp and add them to plate of lettuce, onions, peppers and your very own specialty sauce for a delicious nutritious twist on salad.